Candle lit. 2 pm Eastern time. I'm reading and writing from Tampa, Florida. 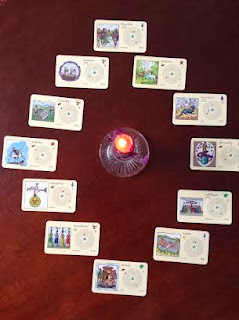 Meditating this afternoon, I had a flash of doing this 12 card reading, one card for each sign as a special focus for the year, and each card a particular focus month by month for all signs. Beginning with Capricorn, at the top of the wheel also known as the 10th house, ruled by Capricorn, the first card is Capricorn's for the entire year and also for all of us for the month of January. The 2nd card at the 11th house place will be for Aquarius and for all of us for February, and so it goes through all 12 months and signs. I didn't "decide" this. It was an image received that I decided to go forth from. Therefore you might ask why not begin with Aries or why not make Capricorn's card for December and Aquarius's for January since the birthdays begin then. However, the vision came through like this, and so it is. I hope you enjoy this. Share freely and peek back as the year goes, maybe just before each month's New Moon or beginning and maximize whatever parts of this make sense for you this year. Finalize: The first New Moon of 2014 is on New Years Day and this card suggests coming to conclusions or decisions of things that have been pending rather than venturing into brand new territory. Take what you've been exploring or contemplating and make a decision about it. Jupiter and Venus on this card, interestingly, are opposite this winter in Capricorn and Cancer indicating much of this will relate to relationships and the practical matters of love and partnership. Opportunities for growth are abundant once the decision is made. Venus is retrograde for all of January and we are reexamining our role in love relationship, balance in business partnerships, and our feelings surrounding love and partnership generally. Capricorn, solidify something as soon as possible after New Moon. For all, aim for growth and finalize your answer about love or opportunity with an important and long considered decision that is timed right just now. Sustain: Significant effort will be needed in February to sustain the results and fruits of labors already underway. Aquarius, you will see reason to strengthen and nourish what already exists in your life so it doesn't waste or slip away. Think of February as a garden or even a bank account and do things that add to the abundance. Where do you need to invest more effort or interest and attention to help grow or maintain it? A relationship, your work, or your home are likely examples, but it could also be yourself, your body, your spirit that requires sustenance in February. For all of us make sure you're feeding and nurturing and appreciating what you have built and what you hope will grow even further. The Sun and Mars appear on this card, and therefore fire energy, from the solar plexus and your strong will should be fully engaged to maximize the month's potential. No slouching or procrastinating. Consider how music or even a note resonates in the air. How can you extend or enhance the life of something beautiful? Revivify: Interesting word. The card suggests a necromancer bringing a male and female back to life. The Sun and Uranus as astrological symbols indicate unique forms of expression and news. Pisces, as your yearly card, I ask you what do you want to revive that may seem to have gone by? A talent or a relationship are symbolized here as is the willingness and ability to communicate clearly and find your voice without worry about judgments or disagreement from other people. For all of us, animate, make life more lively, resurrect something joyous that you've been overlooking or haven't made time for. Subdue:The word subdue means to overcome, quiet or bring under control. It can also mean to vanquish, and with Mars and Uranus as the astrology symbols on this card and a knight like figure on a moving horse, you will defeat an opponent or overcome obstacles this month. Aries, this goes double for you and with Uranus in your sign and Mars as your ruler this is a particularly good card for engaging all of your confidence, fire energy and motivation. For all of us, gaining control over impulses in favor of moving constructively and with control is favored. Subdue what holds you down and vanquish the temptation to give up on yourself, as Aries is the sign of the individual. Examine: Investigate and evaluate how far you've come. In May, a thorough analysis of what is working for you is in order. Venus and Pluto are the planets we're shown here and Taurus is one of Venus's signs. Love relationships and romance are up for examination. Are secrets or hidden influences holding you back from fully giving yourself in a relationship? Examine your motives and the intention of your partner. If you're not in relationship, evaluate any situation for harmony and balance. Taurus, step back and examine the results of your efforts and see if more attention to detail can improve upon what you've already accomplished. This is a chance to be objective, see the realities in all their glory and imperfection both. This is how you inform May's decisions and direction. Inundate: June is full and busy. A month of effort and digging out from under if that's the case. Gemini, your month is filled with events, announcements and business. Even those of us all caught up will be engulfed in projects and work. A saturation level is reached. Enterpreneurs will become employers and businesses may need to hire help! All we've aimed for and more comes full force. News and information is another thing that inundates us, and Mercury and the Sun grace this card meaning we'll be very busy trying to keep up with replies, studies, and projects. Mercury will be retrograde during this month making it extra challenging business and communication wise. And though Mercury retrograde can be a good vacation time, this card indicates no it's not time to take the days off. Detail: The parts make up the whole. Are all the parts in place for efficiency and a complete picture. Cancer is the cook and the ingredients are very important. If you're making substitutions, be sure they serve their purpose well. July is a month not to skim over anything important. Cancer, refine any part of your life to make it better than just good enough. Have a trusted editor or back up person who can objectively point out what you might be missing. Go the extra mile to make something very special, from a home related project to the ingredients for a festive event. Tune in to things we take for granted, like light and use of space and daily routines and appreciate all the small working parts. Jupiter is the big planet, getting ready to leave Cancer this month and Uranus throws surprise parties and initiations. How might this apply? Unite: It's Lovers time according to the cards. Venus and the Sun are at play and that means love, romance and commitment. This image shows lovers in the water, surrounded by green, fertile earth, sun and moon looking on. All is in balance. The support of earth and depth of waters, male and female energies of the sun and moon. The lovers wear gold crowns as a sign of victory. This is a month of love and of drawing opposite drives and energies even within us together to form something new. Leo, the forces are with you. Affiliate: September is about finding our groups and establishing our place in them. It's a time to join forces and share common interests and act on ideas with the power of many. Jupiter and Mars call for conscious action. Virgo, find a sense of belonging or take a leadership role. Mutual support, strong commitment to ideals, and effort as a community is September's theme. Be a part of something bigger. Diversify: Take all you've learned and all you've done and find a new way to apply it in October. Libra, step out of your comfort zone! Your knowledge and talents are applicable in more ways than you've experienced. Develop a new skill or expand as a source of income. Investors, go over portfolios and consider options. Business owners, create a new line and expand your outlets for sales. Mars and Neptune on this card call us to be actively creative. Take something you have or do already and put it to new use. All our eggs need not be in one basket. Energize: Moon and Mars are our emotions and our physical energy and drive. Put them together and you are unstoppable. Motivate from the core, where how you feel and what you do align. November is month of accomplishment and success, and that extends beyond earthly business to finding that place of harmony where your passions drive your actions. With heart, mind and soul focused, energy can be boundless. Scorpio, your ruling planet Mars is present on this card. You'll be a warrior for something or someone this month and it may feel like no effort at all since it comes from the truest, most authentic place in you. Mature: Sagittarius, don't wait all year to consider this since it is your idea for all of 2014. For all of us December marks a time of maturing. Something can mature as it comes due like an investment account you can now draw from or fruits of your labor which you can now enjoy. Though this suggest important responsibilities will be our December work, Mars and Pluto together say this has been a long time coming and we are ready. What you've been preparing for, even if it seemed the day would never come, arrives toward year's end. Pluto unearths what's been buried like a latent talent or a hurt not healed. Recognizing and acting on that, you move to a new level of being. Sagittarius, expect to be offered new challenges this year that stretch you beyond your perceived limits. This may be particularly true in terms of the role you take in taking care of others. Notice the ways in which you are not the child anymore. Robin's Zodiac Zone is now part of www.RoZoYo.com where you'll find additional content! The Sagittarius Moon is void of course from 6:36 am until 1:01 pm ET on Tuesday. This long void of course Moon is not suited to major decisions or anything requiring best judgment and attention to detail. Be cautious. Today is prime for a road trip where you don't have to be anywhere particular but just want to enjoy exploring. We'll lean toward going our own way, either together or solo. Rules will be broken. Timing could be way off. The Sun in ambitious Capricorn squares Uranus in spontaneous Aries. Challenges and new developments that involve goals and plans is one aspect of this. News may be unexpected and random. Our reactions may not reflect long term point of view. Try to let news settle in without overreacting. Mars square Pluto has to do with out deeply ingrained ideas of justice. It may seem unfair if you've worked hard for something that you now find will not go as planned. This will bring up past injustices or things considered failures. Some people will be dealing with strong feelings today and the mood could be volatile. Another common effect will be overcompensation. Sagittarius Moon and all of this Capricorn energy are quite a contrast. Half the population may be missing and unavailable while the other half try to muddle through adjustments and responses to today's news. Today's color is red. Yesterday's themes continue with Pluto and Mars at work, bringing up realities we must accommodate for and challenging us not to blow up if disappointments are present as the year ends. The Moon is void of course until 1:01 pm. The hours before that range from confusing to relaxed. Those of us not trying too hard may be faring best. Knowing what you can and cannot control is helpful on this unpredictable morning, a follow up to Monday. With Mercury square to Mars, tempers or arguments could flare easily. Use wording wisely. Be tactful. Working through a fairness issue, something related to recognitions, promotions and anything deserved is worth the time and careful judgment. This is also a day to reconsider plans and get ready for a new cycle. Capricorn Moon can help you detach from the emotional part and get things sorted out and prepared for moving forth confidently as soon as tomorrow. The Moon in Capricorn aligned with Neptune indicates a simple, easygoing New Years celebration is in order. Neptune favors music and the arts as well as a spiritual spin to the night. It's not the year to overdo it, slight someone you care about, or overspend. Neptune often puts romance in the air. Enjoy. Today's color is green. New Moon on New Years Day makes this a good year to make a resolution since it's a great day to start something fresh! This coincidence is on your side if you hope to forge a different path for yourself, adopt better habits or change a relationship for the better. Career goals are especially favored by Capricorn New Moon, and this is very relevant for Aries and Capricorn now. Cancer, the new vibe and decisions relate to your marriage or long term relationship. Saturn is even aligned with the Moon for longevity and strong intention to go with decisions and resolutions started this week. It's a very strong Capricorn influence with the Sun, Pluto, Moon, Mercury and Venus playing out in this sign! That means be organized, goal oriented, practical, and reach for great heights. It may be a good time to take something you'd all but given up on and try again if your head and heart are still in it. Today's color is white. Mars is working relentlessly and overtime in Libra from last month well into 2014. The recognizable pattern relates to justice and balance in partnerships and families. The Sun in Capricorn squares Mars today and working to establish balance and shared responsibilities and equal treatment is worthwhile. It may require a bit of wrestling to try and get it right. Libra and Cancer are likely to notice this is home and family life. Capricorn, career and your reputation are worth considering. The Moon and Venus retrograde meet in Capricorn. Gong back over decisions and actions you've taken as a couple or relating to partnership and love makes sense. It's not meant to be dramatic, instead it's about realigning and reworking. Cancer and Capricorn are central to this action. Leo, you can revamp routines with a partner or collaborator. Sagittarius, balance in employment and money are your consideration here. From 6:12 am to 12:03 pm ET the Moon is void of course and then shifts to Aquarius. Aquarius Moon further guides vision, planning, and designs that come from a logical perspective. Figure out how to make something work better today! Wear blue. The Moon is in Aquarius. All week is prime time for fresh starts due to the New Moon on New Years Day and Aquarius is a good Moon sign to assist in the design of your plans. Aim for long term decisions and results today. The Moon is less emotional and more logical in Aquarius. This helps with anything that needs perspective. Mercury in Capricorn is also goal and planning oriented. Mercury opposes Jupiter in Cancer and finding reasonable tones and methods of family and partnership communication is one thing to aim for. Find compromises that work and are beneficial today. The Moon is void of course from 8:47 pm to 11:58 am ET on Saturday. Stay away from online shopping or messages you might wish you hadn't communicated. It can be a very good, social night out. Wear turquoise. The Moon and Neptune meet in Pisces for spiritual, intuitive, imaginative and romantic effects. The early hours are void of course Moon time. At 11:58 the Moon chnages signs and before that the day may seem to just meander. We'll be sensitive to moods and feelings and tuned in to things that are subtle. There are no other aspects and all Pisces traits and qualities are magnified today. Show compassion. Set the tone. Create the mood. Forgiveness is favored too. Wear light blue. The Pisces Moon is in harmony with the heavenly bodies in Capricorn including Mercury. This bodes well for conversations even about sensitive topics. We'll tend to be more empathetic yet also realistic and it's a good balanced combination! The Sun in Capricorn opposite Jupiter in Cancer involves optimism and growth with family and/or business matters. Bring things to scale, find compromise and express your vision, requirements and hopes. The expressive nature of today can lead to great progress where agreement is needed and a sensible plan can be put in place. Today's color is purple. The Moon and Pluto align in earth signs, Virgo and Capricorn. This is productive and organizational energy. Focus on work that needs to be finished, holiday tasks and business matters. Writing, working with finances or numbers, rearranging, and building are favored. Interpersonally, there's for need for flexibility and responsibility to each other. Try not to get fixed on one way of doing things. Virgo is a sign of service to others and it will be satisfying to take care of something for someone else, volunteer, or be neighborly. Pluto relates to things we must put behind us. Let a problem you can't solve go, resolve a long term issue in a detached way with no emotional charge, and recycle only what's useful. That goes for relationships and feelings as well as tangible items. It's a good day for feng shui, housecleaning, and getting rid of cobwebs in the head too. Virgo is physical, earth energy and when the Moon is in this sign, get out of your head and work the body. Yoga, a good run, dancing and working hard is favored. It's Mercury's last day and night in Sagittarius, for travel opportunities and educational things you want to line up. Get the info and fill out the application or paperwork. Today's color is brown. Mercury changes signs, and that is often an indication to slow down and be patient. This is not a good dday to act on impulse. You'll notice minds changing as the communication and planning planet moves to more grounded Capricorn. Ambitious and orderly here, Mercury will help take ideas to reality, may cause us to hunker down, reorganize, and deal with authority issues or roles more clearly. If you're part of a system or administrative organization, news may be important and changing very soon. This is a very business like place for the planet that governs much of our day to day commute and communications as well as decision making process. Mercury takes some of the fire/excitement and high emotion out of it in favor of the practical/how to approach. The shift happens at 5:12 am. It might feel good if too much has been swirling and not materializing. Aries, this is a good spot for your career and ambitions. Capricorn, Mercury sets you in personal plannng and action mode. Cancer, you'll find that discussions with your partner/significant other are about life stuff and business you're deciding on together and soon. Virgo Moon stays with us until 1:17 am ET, 10:17 pm Pacific on Christmas Eve. This continues a grounded, task oriented influence though the void of course Moon at 10:55 pm ET signals time to relax and enjoy. A simple night is best. The Sun and Neptune align for creativity, romance and good feelings. Find balance and solid, reliable comfort. Today's color is blue. The sign of harmony rings in Christmas Day! Even if this is not your holiday, aiming for balanced interactions, fair decisions and treatment, and reserving judgment on anyone is the way of Libra Moon. There are many aspects showing possible debate, arguements, topsy turvy changes in plans, and potential for pessimism. Mars in Libra insists on justice. You may have to go the extra mile to share work, responsibilities, and see another perspective. This is not the day for an offhand comment or intentional topic that may trigger bad feelings or extreme differences. Seek peace even if that means holding your feelings and opinions and channeling them in other ways, or at a later date. Tread lightly, try to enjoy and smile like you mean it. Christmas this year is meant to be social, friendly, and neutral emotionally. Have a buddy you can text or talk to if things are difficult on the home front. Pair up before Christmas and form the plan! It may be a nice Christmas for couples with the Moon in the sign of relationship, but Libra and Aries should work extra hard to keep peace. Gemini and Sagittarius in relationships are favored by Moon in the sign of romantic love. All signs benefit by having one person they can rely on to "be there" even if not in person. Today's color is white. Libra Moon squares Jupiter and is a challenge to make progress. Work on something from relationship to a project today. Jupiter in Cancer indicates many family relationships could benefit most from extra care and attention. It's a time of potential growth and reaching new levels, but with strong effort. Mercury and Neptune form a highly creative and constructive sextile and it's a good day to work on your art, your business, a project like film or music or an innovative construction venture. Writers can use this energy to create too! It's another good day to buddy up. Dates are nicely timed. Today's color is lavender. If you've been socially busy, the Scorpio Moon is suited to drawing back into personal business and things you need to focus on. After 3 void of course hours, Scorpio Moon moves in at 8:58 am ET. Neptune, Mercury, and the Sun align with the Moon for confidence, imagination, romance, passion and the right words to express yourself or engage in productive conversation. Consider actions to have long term implications and impact. Act with an air of intention and surety. Commit to a plan or a person. Today's color is indigo blue. Saturn points out places for growth and gives today a serious spin. Take others seriously and act with the best information and intention possible. Elders are ruled by Saturn and it may be a good day for a talk or visit with the older and wiser. Jupiter and the Moon in water signs bring out the creative and romantic. Do not be tempted to wallow in emotion unless it's the most positive feelings you're experiencing. It's a good day not to get too caught up in yourself and your problems. Look for beneficial situations and be with positive people or people who encourage you even if they take a hard stance along the way. Think maturity and wisdom. Today's color is maroon. It's a day of news and conversations. Mercury and the Sun in Capricorn favor practical plans and acting on real opportunities. Overdo or pending decisions may be made now. Capricorn and Scorpio are among the most likely to break news to family or friends. Cancer is in line for major relationship decisions. Mercury and Uranus imply that much of this may come as a surprise. Give yourself time to form an opinion, judge or adjust. Try not to react out loud too quickly to unexpected announcements. The Moon is void from 8:54 am to 12:37 pm and then in Sagittarius, a sign of excitement and motion. It's a travel day and one way or another we're on the move! Today's color is yellow. On Wednesday night December 18th I'll host a google hangout online. Pour yourself some tea or a drink and let's get together for a winter chat. I'll start with the astrology of this Full Moon and Solstice time and what's ahead in the month of January. You can chime in with questions, observations, your own wisdom, and most anything relevant to living intuitively during this winter season. I've been thinking about this for a while, and it's finally just the right time. I chose 8 pm to give everyone time to get home from work and get kids settled or whatever you need to do. All ages are welcome and we can learn so much from each other! Gather with me on Wednesday night on Google chat. Add me on Google today and I will add you. I'll start the chat and invite you in. You'll see the invited pop up when you're logged on. just be online and ready by 8 or a couple of minutes before. We'll spend an hour but if you can't stay for the whole hour, it's ok. You can come and go as you please. You can participate or just listen. Find me as Robin Ivy Payton on google plus and I will add you too. Donation of $10 suggested, but pay what you can. This is the paypal button. I'm looking forward to trying this and if it's great we can do it more often! Happy Solstice and Holidays to all of you! News: This Weekly Forecast and more are now found at www.RoZoYo.com ! Readings, astrology, and my yoga schedule and other news are all found on one website now. I will continue to update here for a while, though you may be redirected to the new site soon. For your weekly forecast, just click the Zodiac link at RoZoYo. Robin's Zodiac and Yoga. Thanks! Mainers or those visiting for the holidays, I will teach two classes on December 24th and 26th, both at 9:30 am at Well Heart Yoga in Cape Elizabeth, Maine. Please drop in and join me! The Moon will be full overnight in Gemini, at 4:28 am ET and Uranus is direct at 12:40 am. Gemini Moon fills the week with news, announcements and multiple ideas to potentially take to the next level. Resolutions at Full Moon time may involve siblings and family as well as business plans and education related things. Gemini is a sign of movement and intellect. It will be hard to remain stagnant or still. Do build in some calm time to balance the overabundance of activity and information. Do keep up with messages so you're informed. Moon opposite Gemini's ruling planet Mercury involves philosophy of life. People will be making decisions about how to live and what to pursue. Change isn't easy at times and this Full Moon's events will require adjustment. Transform a situation to suit you better. Adapt, transform and think out of the box when problem solving. Sagittarius this is about commitment and relationships. Gemini, this Full Moon is very personal and could herald decision making time as well as self in relationship with others. It could be very exciting to reach a culmination in something you've been involved in or it could require lots of time to adapt and restore. Cancer and Capricorn need that restorative time and should take care of health and live by a solid routine now. Leo and Aquarius are favored for social times, friendship and allies, wishes and good luck. Virgo, a recognition of your value and skill is due. The spotlight shines on you. Pisces, home is number one priority. Libra and Aries, communication, learning, and travel are your keywords. Try not to be rushed and think clearly. Scorpio and Taurus, finances are highlighted and making a decision about money or work makes sense now. This forecast really goes for the whole week and family matters will be stirred up and significant all week long. Understanding that everyone is going through much change, have compassion. A detached point of view may also help. Don't get too caught up in overthinking, a tendency of Gemini Moon time. Brains will be full and so will the calendar and to do lists. Business will not take an early holiday break. Pace yourself. Today's color is white. The Moon is Full before dawn on both east and west coast and across the ocean, full during the day. Gemini Moon is about changes of mind and communication as well as movement. Time to finalize, sign, take the test, submit what's due and put the finishing touches on things. The Moon is void of course from 4:48 am to 12:40 pm and then in Cancer. Home and family, particularly siblings and cousins, is part of the Full Moon focus and eventfulness. Maybe you'll get happy news from a family member! Aries and Pisces, the Full Moon is placed near home and family in your chart. Stay on top of things at home and aim for agreeable interactions with family. For some it will be a very eventful time. Full Moon pressure bears on the mind more than anywhere else, and Gemini also relates to the nervous system so feeling keyed up and with too much to think about, we can react strongly. Do calming things and find calm places to spend time if that's the case. During void Moon, try to avoid spending money or having an important talk. Save it for evening. The Moon and Neptune align for romance. If anything is on the table for confrontation, Mars in Libra is pushing for justice and balance and anything less will not do. Mars and the Moon activate emotional situations, especially with family, and words are the weapon or the catalyst for positive change, depending how you use them. Negotiations and conversations are powerful tonight. Choose wisely and stay rational in your debate. Today's color is light blue. The Cancer Moon is just past Full, however there are peaks with hot spots in our lives as the active, recurring T square in the cardinal signs is worked up today. Uranus, now direct, in Aries squares and Pluto opposes the Moon. Some potential awakenings and flare ups relate to sudden change, unexpected events, old ghosts, family, and larger organizations like the workplace and corporations. Cancer, Aries, Libra and Capricorn are the cardinal signs hosting this action. For all signs, business and personal things alike are impacted and if it feels like a recurring pattern you go through once or twice a month, that's probably the T square effect at work. Fairness is of high importance and value in negotiating these waters, as is family responsibilities. Be progressive not regressive in any way possible. The squares look for momentum and the opposition for middle ground. The Moon and Jupiter meet overnight which is beneficial for improvements, travelers, and optimism. Today's color is black. The Moon and Jupiter meet monthly in Cancer, taking some of the edge off issues that persist. Cancer gets the strongest benefit. Sagittarius may find this smooths things over with financial matters and this is the astrological reason for a lucky Pisces year (we're right in the middle of it, until July 2014). Resilience, opportunities, good fortune and positive turns in health matters are some of the effects. Saturn is in harmony with this conjunction and gives the nod to go ahead with positive and meaningful intention. The Moon opposes Venus activating all that needs to be worked out with couples and partners, especially Cancer and Capricorn. Venus is on the cusp of a retrograde that will start the 21st so this is a good time to get a jump on that and make a good decision together now. The retrograde is a time of review but not such an easy time to get things going forward. Practical things like money, work, and home issues that impact each other are the work of Venus in Capricorn. The Moon moves void of course at 11:37 pm to 1:48 am. Today's color is pink. Leo Moon is just in time for weekend festivities. The Moon aligns with Mars in Libra and it's very social for parties and events. Competitive athletically and intellectually both, the Moon/Mars team favor creative work, extroversion and action. Kids will need to be kept busy and entertained. Performances are well timed for high energy and extra shine! Uranus adds that spontaneous element that says anything can happen and we may need to roll with changes at the last minute. Be festive or increase optimism. Leo looks at the bright side. Today's color is gold. The Moon is in Leo for continuing the party. Find people you love being with or just get out and socialize. Events are nicely timed for good feelings and festivity. During Leo Moon time dress to impress or feel good! Up the ante a little bit with everything. The Solstice is at 12:11 pm ET and the Sun shifts to Capricorn for the official start of winter. The Moon and Saturn square and debates may be stubborn. It will require a lot of work to compromise. Be willing to do that or leave it alone. Venus retrograde begins at 4:53 pm in Capricorn. Capricorn, the energy is really shifting in your direction so work with it. Venus retrograde will have us revisiting ideas about relationship and what works on a day to day, practical, almost managerial level. No matter how in love you are, the life stuff comes up for revision now. Cancer and Capricorn may feel this most, as well as those with Capricorn or Cancer rising signs, Mars, Moon, or Venus. Today some serious things may be at the back of minds as you celebrate the holidays. Let Leo Moon guide you to the center of things. Wear silver. The Moon is void of course from 8:25 am to 2:19 pm. Mercury and the Sun work with the Moon today to ease things, however during void of course Moon time, keep life simple and save any shopping receipts as well as other paperwork you might need later. The morning appears to be full of talk, stories and plans. The Virgo Moon moves in and aligns with the Capricorn Sun and opposes Neptune, saying keep it real. Feel productive by cooking, wrapping, making repairs or building and working on projects. Relaxation is a good thing too, especially if you have accomplished something that will otherwise take up your thoughts. Get a physical workout or walk into your weekend. Today's color is navy blue. The versatility of Pisces Moon time supported by Saturn and Jupiter is good for business and decisions (more than on a usual Pisces Moon day!). Pisces Moon puts us in the introspective and spiritual zones, and is often an emotional time, but Saturn lends structure and a mature outlook and Jupiter provides the inspiration for growth, prosperity, and wisdom. It's a good day for taking care of health, both physical and emotional. Seek answers, discuss important topics, or make a good business decision. Don't give up as the Moon and Sun square for progress. Situations could seem so changeable that what to do is uncertain. Use the ever shifting energy between Pisces and Sagittarius to find alternative solutions, things to try out and experiment with, and open to new ways of doing things. Connect, support, help out without being asked. Keep strong boundaries with people who tend to overstep or ask for too much. Saturn should help with drawing the line and holding it up even if pushed. Romance is in the air tonight. Today's color is light blue. The Pisces Moon is void of course from 1:41 am to 8:06 am ET. The Moon and Venus align for good feelings, romance, and sentimentality. The Aries Moon comes in like lightning and shifts the focus to things that need to be accomplished or confronted. Opposite Mars, the Moon is in a potentially explosive place and if an argument or worse could flare, stay out of it. Nerves may be on edge in any tense situation. Stay cool cause there's plenty of hot air to go around and you don't need to add yours and hit the boiling point. Uranus fills today with speed, turns of events, changes of heart, spontaneous action. Resist an impulsive move or word you'll wish you hadn't spoken as Mercury and Uranus align. Our quickest thinking and best judgements are often not the same. Take your time responding today. If you enjoy being busy, working under pressure and initiating, you'll feel at home but for some the fire energy will be over the top. Use it well to inspire or motivate rather than complain and fight. Doing your own thing may be easier than collaborating. Wear orange. Aries Moon time is full of activity. Mercury, Pluto, Jupiter and the Sun act with the Moon with a variety of influences. With Jupiter, family and home related things are likely to come up for discussion and working through. Some of that will be ongoing challenges up for resolution. Be progressive and try not to hang on to an obstacle or way of thinking that's past it's time. Practical energy is favored. Have an attitude and approach that helps things get done and move along. Tonight the Moon and Sun combine for good feelings, social time, and anything involving travel and movement from planning a trip to leaving. It's also a good night to work on things, like college applications, that can take you new places. Refresh your outlook. Wear red. The Aries Moon gets us started, and with Jupiter and Saturn aligned something that's been pending could easily fall together today in a big way. If you're trying to sell a house (and maybe you're an Aries or Leo?) or land a new job (especially relevant to Libra or Gemini) or you've been trying to resolve a health issue, today has the right elements for making it happen. Take agreements seriously. Know that the Moon is void of course from 10:37 am to 3:40 pm ET. Those hours are not good for shopping, ordering online or major conversations that need to be remembered, but if you do those things save receipts and get things in writing. The Taurus Moon is solid for decisions and taking action and moves in and aligns with Neptune for a celebration if you do have a victory and for pleasure and creativity regardless. Plan a nice night or let it happen with music, art, romance and good food all favored. Today's color is green. The Moon aligns with Pluto in earth signs. Earth energy helps us make things tangible and real. Build, create, have something to show for your work. It's a great time for a sensible, well thought out move. Consider what you do today to be long term and challenging to alter or get out of. Taurus rules the throat. Say what you need to say. Say what you mean. Scarves and necklaces add to your outfit or could be on your shopping list if you need a holiday idea. Simplicity and relaxing into work is the order of the day. It's a cozy date night. Today's color is pink. Taurus Moon opposing Saturn in Scorpio is a stubborn combination. If someone draws a line or makes a statement today with a straight face, no matter how extreme it sounds, he or she is most likely not kidding. There's not much room for jokes. Business means business. For Leo and Aquarius, some mix around home and career as well as reputation is involved. Scorpio and Taurus could find themselves in uncompromising debates or situations. Gemini and sagittarius, really pay attention to any sign or concern about your health and at least get enough rest and hydration. You could be overdoing it or over thinking it. Venus and Jupiter do a nice job taking some edge off and if nothing too serious is going on in your world. you can really take advantage of romance or come up with expansion plans and decisions as a couple or partners, and Capricorn and Cancer are most involved with this potential. Taurus, things are probably to the extreme either with the challenge of the opposition or the latter which is more fun and promising. Tonight can be a good night for get togethers for al signs with Venus inspiring good times and traditions. The void of course Moon is 9:54 pm to 1:40 am. Be extra careful to compensate for others who are less aware. Today's color is green. The Moon is in Gemini, active with Mars in Libra and Uranus in Aries. This may be quite the dynamic day for ideas, activity, and social events. Gemini Moon sometimes has us running from here to there. Remind yourself to stay grounded if amidst ungrounded people and on the road. One way to do that is not to skip a meal. Remind yourself of routine things. The mind will be abuzz with what needs to be done and what's next. Siblings are ruled by Gemini and this is a day to get in touch with them. Today's color is yellow.